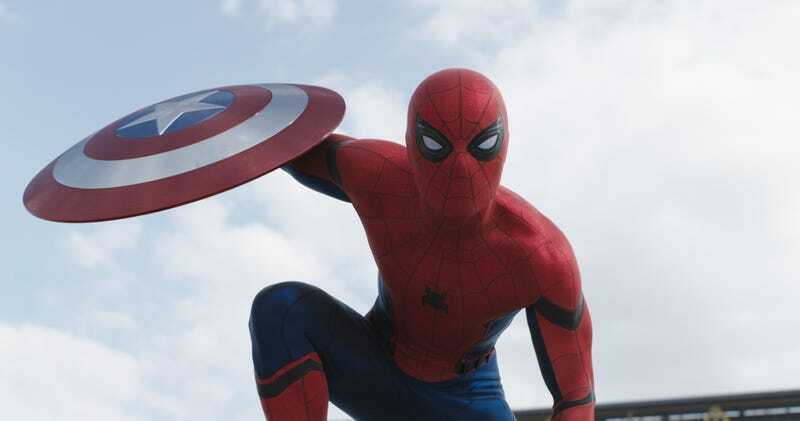 Okay, so you’ve watched the Civil War trailer a bunch of times to see that Spider-Man shot. You’ve probably seen it in all its animated-gif glory in our trailer breakdown, too. But Disney and Marvel have released a high-resolution picture of Peter Parker’s grand debut in the Marvel Cinematic universe to give us all an even better look. There’s actually a remarkable number of things you take in, considering how traditional this new costume seems. The basketball-esque texture people disliked of the Spider-Man and Amazing Spider-Man suits is still there, but much finer, giving it a shinier look. Meahwhile, the isty-bitsy spider logo is very in line with Todd McFarlane’s style of Spider-Man. The little black clips all around his waist (maybe to hold canisters of web fluid? ), and the black bits of armor on the arms. These aren’t your Deadpool-style CGI eyes, although the effect is likely enhanced by CG trickery. The white area increases and decreases in size by an intricate series of different shutters opening or closing, just like a camera’s aperture. It’s maybe a weirdly over-elaborate way to bring a comic book staple to the big screen, but we can’t argue with the results. Between Spidey in Civil War and Deadpool, you have to wonder if 2016 is secretly the year of animated superhero eyes in movies? All these years of inarticulate masks seem rather silly in comparison. What do you think of Spider-Man’s new cinematic look? Let us know in the comments.